Mexico is world-renowned for its exotic and mouthwatering cuisine. Food plays an important cultural role in the country and food in Mexico is closely related to symbolism and tied to its festivals. Mexican cuisine is also ranked amongst the best cuisines around the world by various reputed tourism professionals. 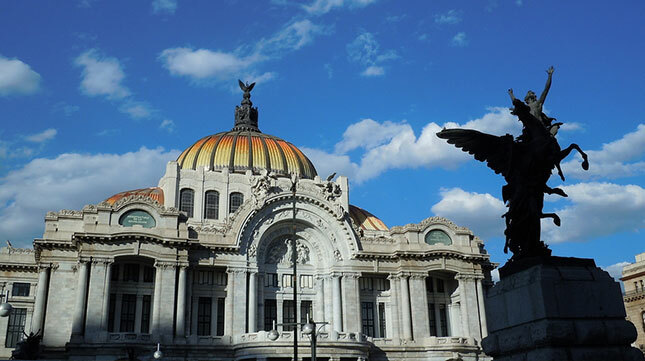 Read on to find out what the capital of the country - Mexico City - can offer Muslim travellers. Mexican cuisine is considered to be amongst the most complex cuisines in the world – on par with popular fare such as Indian, Chinese and French cuisine. Native ingredients are used in many dishes and most of the popular Mexican dishes are made of corn, chili peppers, tomatoes, squashes, avocados, cocoa and vanilla. Halal food in Mexico City and the rest of the country is quite scarce. However Mexico City does offer a couple of Halal restaurants serving a range of South Asian and Middle Eastern food. Tandoor restaurant - located at Copernico 156, Polanco, Colonia Anzures, Distrito Federal 11590. La Casbah is run by Muslim owners and serves a delightful range of Algerian and Moroccan Halal cuisine. Takeaways are also a popular option when dining at La Casbah. Tandoor is a South Asian restaurant serving Halal menus of enticing Pakistani and Indian dishes. However the restaurants are not necessarily Halal-certified and it is recommended that you enquire with the restaurant owners to verify that the dishes are all fully-Halal, to be sure. The main meat dishes of Mexico consist of pork, chicken, beef, goat or sheep and Muslim travellers should be wary of the widespread consumption of pork, which is used in several of the country’s main dishes. Popular Mexican food items such as burritos, tacos, carnitas, enchiladas and chalupas are commonly served with pork and Muslim travellers need to be highly careful of what food items are included in dishes. Muslim travellers should also be aware that even if they opt for vegetarian cuisine, there are many Mexican restaurants that use animal fat – usually pork fat – during the preparation of food. This practice was introduced by the Spanish a very long time ago and is widely used around Mexico City and the rest of the country. Great care should be taken to avoid eating at restaurants which do not use separate utensils for the preparation of both Halal and non-Halal food items. Though Halal food is quite scarce, travellers who plan ahead will be able to have an enjoyable stay in Mexico City. It is best to opt for a hotel that offers a private kitchen so that guests can prepare their own food with local ingredients that can be easily purchased from the marketplace. Plan well in advance!